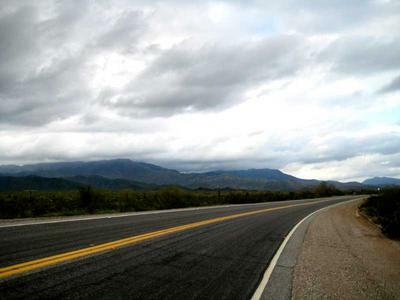 The Harquahala Mountains are the highest in southwestern Arizona. There is a 4 wheel drive road to the top accessed from the southeast side, and a hiking trail to the top accessed from the northwest side. 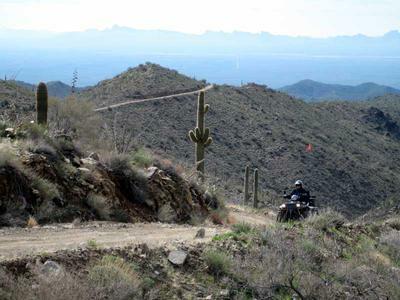 Either way you reach the summit, you'll have awesome views of the surrounding Sonoran Desert landscape. There are many great sites for RV camping along Eagle Eye Road. 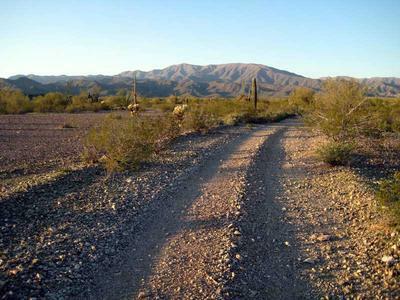 The GPS coordinates here will lead you to one good campsite south of the Harquahala Mountains near Weldon Hill. For more information and photos see my Harquahala Mountains Picture Tour here. I looked for a campsite today northwest of Tonopah near Big Horn Mountains Wilderness and Hummingbird Springs Wilderness. I found a spot along Eagle Eye Road just west of the wilderness areas. It is near the base of the Harquahala Mountains. Here I go, on another RV boondocking adventure! Weather: It was windy on the day I arrived and pretty breezy today. I had rain yesterday afternoon and last night. It was sunny today with a high in the mid 60s. Weather: It’s been quite nice lately; sunny with temps in the upper 60s, low 70s; breezy today. On March 2nd I biked to the top of Harquahala Mountain. It was about 11 miles one way from where I’m camped. I left at 8 am and got back around 6 pm. It took 5 hours to get to the top (including breaks). It’s a very steep 4X4 road and I had to walk more than ½ the way up. There are excellent views in all directions from the summit. The road was quite busy with dirt bikes, ATVs, and SUVs. I got a great workout! I saw only 1 other mountain biker, and he was going down. I had a flat tire and had to walk the last 4 miles back to my campsite. This has really been a quiet and peaceful campsite. Not another vehicle has passed by this small jeep road that I have seen. It’s a pretty quiet highway too, Eagle Eye Road. It can be a bit breezy around here, but otherwise it’s a very nice spot to camp.